Alessandra Gest from Bellaire, TX, studied in Bosnia and Herzegovina. 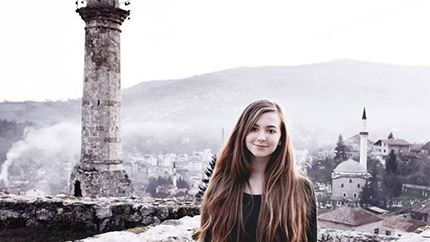 YES Abroad participant Alessandra Gest from Bellaire, TX, currently studying in Bosnia and Herzegovina, is February’s American Abroad Student of the Month. Since arriving in her host city of Banja Luka, Alessandra has shown a remarkable understanding of cultural differences and an impressive eagerness to immerse herself into the local community. When her classmates consistently spoke Bosnian, Croatian, or Serbian around her, she worked hard on improving her language skills in order to engage with her classmates. Alessandra has accrued more than 50 hours of community service activities including charity events, foods drives, and preparing meals at the local public kitchen. For International Education Week, Alessandra prepared an outstanding presentation on stereotypes about the United States. She also made a presentation during Black History Month aimed at raising awareness about language and the historical context of certain terms. Throughout her stay, Alessandra has maintained an almost perfect grade point average at school. Alessandra continues to foster cultural exchange in Banja Luka with her consistently positive outlook and eagerness to engage with her community.